Neil Lennon has leapt to the defence of captain Scott Brown after Sunday’s Old Firm encounter at Celtic Park. The hosts won the game 2-1 thanks to a late James Forrest winner, but the major talking points centred around the home skipper. Alfredo Morelos saw red for a first-half elbow on his opponent, while Ryan Kent was lucky to escape punishment after appearing to punch Brown after Celtic had netted their second. There was also a post-match bust-up after Andy Halliday confronted Brown. 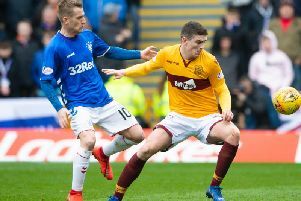 The Rangers left-back was shown a second yellow card for his troubles. Lennon said after the fiery encounter: “I’m not happy with the treatment of Scott Brown today. “He has been elbowed and then punched in the face by another player and Rangers should have been down to nine men. “Ryan Kent, after he scored the second goal has either slapped him in the face or punched him in the face and it’s just unacceptable. “We should be talking about a great game of football where two teams went hard at it. On the post-match melee, he said: “I’m sure it will all come out in the wash and I’m sorry I can’t comment on it as I was straight up the tunnel for a breather.